I recently had the pleasure of attending another local AIGA sponsored event on NCSU’s campus. 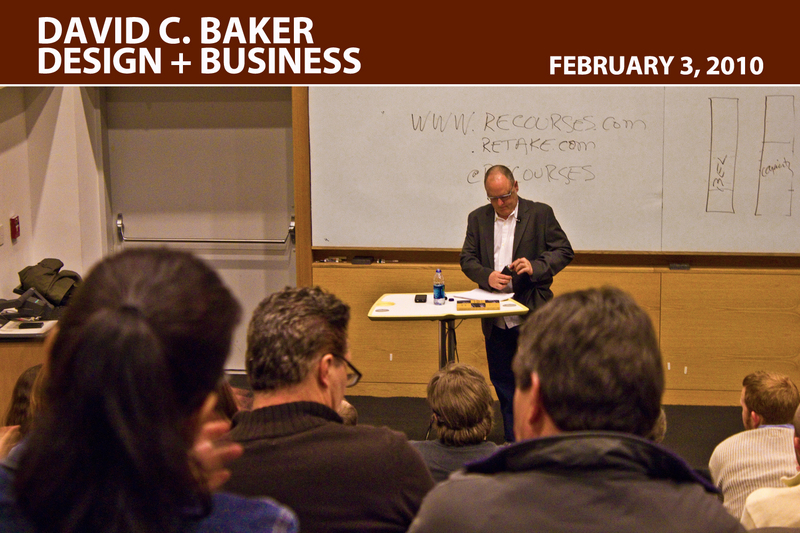 This event was yet another in the Design & Business lecture series, and David C. Baker of ReCourses.com was the speaker. Though the topic was on designer-client relationships in a down economy, I feel like I walked away from this lecture learning just as much about big picture client relationships in general and some great management insight. As I arrived, I was handed a very large packet of information along with a Recourses business card, and then seated in the lecture hall. The lecture opened with remarks from AIGA Raleigh president Matthew Munoz and Woody Holliman of Flywheel Design in Durham, NC. David opened with a comical plug for his business/website, as well as his book Managing Right For the First Time. After looking into his book online, I’ve come to find out that it is a must for anyone in the creative industry, not just managers. Excerpts from the preface, introduction and first chapter can be found here. David proceeded with the lecture by going along with the lengthy packet of info we were given upon arrival. David discussed some very important issues at the beginning that helped set the tone for the rest of the lecture. One thing to keep in mind when working with clients is whether or not it is a good match up to work with a particular group. “Working for the Right Clients in the First Place” was stressed, and with good reason. I felt that this was the most important point made in the lecture. As a creative agency, you can’t just accept work with anyone. It has to be determined whether or not it will be a good fit to work together, and if it will benefit both parties. A creative firm must retain that “ability to say no.” In order to do this, the firm must always keep their capacity to do work below their opportunity as David illustrated. Another important point that was made involved recognizing different types of clients, and being able to adapt when necessary to different circumstances as needed. In dealing with client relationships, communication is key. David highlighted this point by talking about different management personalities and how they can affect relationships with clients. Overall, I think that David’s lecture was very insightful. I thoroughly enjoyed attending, and feel like I was able to take away some helpful/practical ideas & concepts to put to use in real world situations. Categories: AIGA Events, Arts, Events, Graphic Design | Tags: aiga, aiga lecture, aiga raleigh, david baker, david c. baker, design + business, flywheel design, managing right for the first time, recourses.com | Permalink.